AdWords is clearly moving towards higher automated and keywords-less accounts, even if a full automatic long-lasting optimization is still yet to come. Anyway, it is already possible to create campaigns automatically reacting to competitors’ activities and keeping high performances without manual changes. To auto-optimize your account has to have a flexible structure to naturally target new valuable keywords. Pure matching types exclusion campaigns are therefore out of the game. Groups set focus on one or few terms in phrase or exact match, excluding all the rest are rigid by definition and probably even an AdWords developing team believes they are not the best option possible, given the fact that they intentionally weakened phrase and exact matches some months ago. I am forcing the system this way only when users’ real searches are concentrated on few terms absorbing the majority of the budget and competitors are bidding specifically on these terms, skyrocketing CPC levels and zeroing quality scores for broader matches. That is why you mainly need campaigns based on broad match long tail keywords or broad modified medium tail keys or directly use dynamic search ads (in my opinion dynamic search campaigns with no keywords at all will be the founding pillar of the next AdWords account generation – be prepared for that). This approach is undoubtedly more flexible, but still requires to periodically check real users’ queries to exclude unrelated searches with negatives. A real auto-optimizing campaign cannot of course rely on manual adjustments, but only on CPA bidding or optimized CPC. In my experience I am yet to find any other automated bidding strategy fitting all accounts and working as effectively as these ones. Moving to CPA definitely requires several daily conversions (otherwise it will worsen your performance), while optimized CPC is more flexible, but requires more control over time. Of course to apply these bidding automations you need to track all possible conversion actions. If you are not tracking all your online goals you are using AdWords at a fraction of its power. If you haven’t enough of them, then you should consider behavioral conversions (besides online sales/contacts), such as newsletter subscriptions, downloads and even long-lasting or deep visits (in terms of number of pages seen) tracked via Analytics. 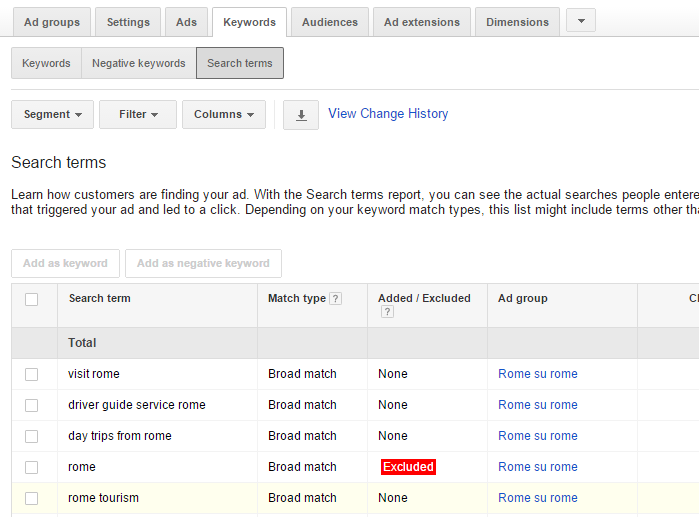 Now using “Smart goals” and importing data to AdWords this is really easy to set. This is not a way to cheat yourself, but to understand where your top quality traffic comes from, even when you try to sell something with no market, no brand or with a terrible landing page! In other terms, something that even the best AdWords campaign in the world will fail to sell. Another vital feature of auto-optimizing campaigns is the equilibrium in budget and real total daily cost. Peaks could come from seasonality or your competitors’ campaigns or… who knows (& who cares)! If in the course of time you have been carefully selecting converting items, you only have to tune their CPCs in order to stay within the daily budget to be sure that all your high potential visitors will actually see your ads. The widespread practice of testing only two ads at a time in each group works only if add new ads on a daily basis or so, otherwise will limit the platform internal optimizing algorithm. Groups without a wide range of variants to auto-test will require much more time and manual efforts to find the best ones for a mobile device, or in certain locations or hours of the day, etc., while leaving active some apparently underperforming ads will not really affect your campaigns, because the platform will rapidly turn their traffic to more clicked or converting ads. 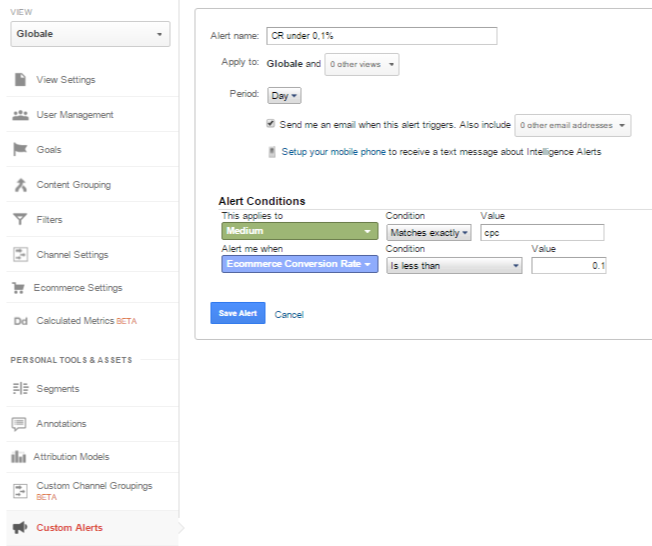 You will finally need at least a couple of alerts to email you if something gets wrong and you have to correct it. The first one should be checking lack of impressions in active campaigns/groups. It is quite simple to set it with automated rules, and it is going to spot all unwanted interruptions due to payment problems or low CPCs. The second, and more important one, should be related to conversions drops. 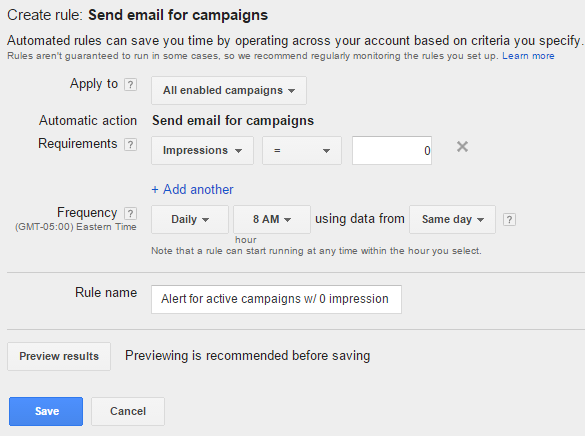 Again you can very easily set an automated rule at campaign or group level, or you will need a script to do it once for an entire account or managing account (former MCC) or can use an Analytics custom alerts. This custom alert only works if you have one AdWords account running and no other platforms using “cpc” as UTM medium dimension (like Bing, just to say one), otherwise you will have to use campaign names (including a specific word in all the ones you want to track will greatly help). This way you will have an alert when something critical is killing your conversions (or even just lowering them under a fixed threshold). Using a flexible campaign structure based on long tale broad match keywords, middle tale modified keys or dynamic search ads grants you from having to check daily your campaigns for new interesting positive matches. You will only have to occasionally control search queries to exclude unrelated searches. Enhanced CPC or CPA bidding coupled with budget and daily expense matching will let you really show your ads to all and only your higher converting prospects. Occasionally add some new ads variants and extensions starting from the best performing ones will keep you in the game with your most aggressive competitors. Finally, setting some lifesaving alerts to let you know when campaigns are blocked or underperforming and doing some monthly optimization checks will complete the scheme. That’s not yet a full automation, but it is really near to the goal. Paraphrasing what Einstein once said: everyone can complicate an AdWords account, you need a touch of genius to make it simpler without losing conversions.